First trip to PDS was 12 - 19 Jan 2013. Group of 8 friends. Stayed in an apartment booked through resa-morzine. Great value and v handy for Pleney lifts, Tremplin bar etc. Snow was excellent due to a large drop the day before arrival and smaller top-ups during the week. I think the lower, busier slopes around Morzine town could be a little sketchy otherwise. Great blue runs in Les Gets, Nyon and back down to Morzine. Nice testing reds both near the tops and lower down, although the lower ones got a little hard in the afternoons. 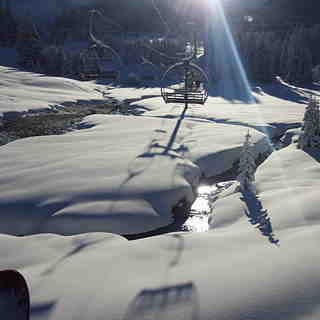 Ski Morzine/Les Gets on cloudy/snowy days and head up to Avoriaz for the sun or if snow not so clever in Morzine. Crowds around first lifts soon disperse as you venture further out. Easy to ski from Morzine to Les Crosets in Switzerland and back by lunch if you can ski blues easily and get the SuperMorzine at 9am. Drink in Le Tremplin between 4 and 7 ish in your ski kit (cold but great crack), have a meal/snooze/shower then head for the Tibetan for a flatliner or two 'til 11 then downstairs to the Cavern for table dancing 'til you fall off. Good place all round. Morzine is a great venue for groups with various levels of skiers and non skiers (as you can always meet up for lunch). With the whole of the Port de Soleil for the taking no problem with variety. Bass is great for all levels and ages, really good one on one lessons. Yes, you pay more but still worth it. The snow institute is also very good. Come on snow. I returned from Morzine on 27th March 2012. The temperature in the resort in the sun was in the mid twenties, but as the sun went over the crest of the hill the temperature fell. This meant a slight refreeze and combined with the hard work of the piste bashers a great day's skiing beckoned the next day. Although the spring conditions meant it was better to get out on the slopes early and maybe finish a little earlier. From Morzine you can take the Pleney lift and ski above Les Gets, or take the super Morzine and ski through Avoriaz and on to Switzerland. A bewildering choice of skiing offering many skiparks and the infamous Swiss Wall, which is not for the feint hearted. The town had a relaxed, unpretentious feel with plenty of shops, bars and restaurants. We had a full Porte de Soleil pass which gave us ample choice of slopes. We particularly enjoyed the reds around Avoriaz. The resorts were all connected well with clear sign-posting and a bus service. Having skied Les Trois Vallees and Paradiski I think would have to rate Porte de Soleil as my favourite of the large ski areas. I shall return next winter. I spent a week in Morzine w/c 29th Jan. The skiing was superb. Perfectly pisted snow if a little cold at times (-22!) The local ski area of Morzine and Les Gets has plenty of piste to keep you occupied for a week. My advice would be head away from the front of the Pleney. All the blues are full of ski schools and the reds were sheet ice. Over in the other bowls near Les Get or Nyon there were lots of lovely empty blues and reds through the trees with a couple of more difficult reds and blacks if you want to test yourself! 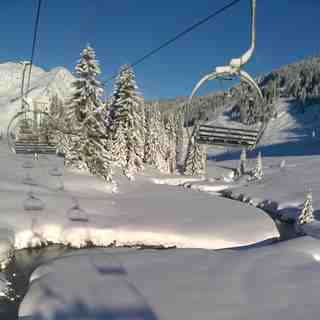 You can also get the Super Morzine bubble up to Avoriaz. There are some excellent blues at the top of the lift. Lift queues were minimal and organised. The food on the mountain wasn't too expensive. I would suggest the smaller mountain restaurants over the big self service affairs as they all had home cooked food at much lower prices. I'd certainly recommend this resort and I'll definitely be going back. I have been skiing in Morzine once or twice a year for the past dozen or so years and love it. The variety of runs, restaurants and apres-ski is amazing. As our budget, group size and accommodation needs have changed over this time we have always been able to easily find something in Morzine to suit our exacting standards. It is also an easy flight (Bristol-Geneva) and transfer (1 hour Geneva-Morzine) or a 10-12 hour (including channel crossing) 600 mile plus 60€ in tolls each way drive (we drive these days as it tends to be cheaper for a family car load). We have been taking the children along for the past 6 years and have tried various ski schools et al but the only one that I would highly recommend, having been with them for the last 4 years, is The Snow Institute ran by Sally and her team. The children have consistently received only the best instruction and childcare and the kids have loved every minute of their time with TSI. This has resulted in them being able to out ski their folks for past couple of trips! Of course there is always the occasional gripe......why does the petit train stop for an hour at lunchtime?. Why is there so little in town car parking? etc, etc. But these are easily outweighed by the positives that Morzine has to offer. We will be back again in early April having already done a week in January. Bring it on! 'Le ball de chien". We stayed in Les Gets in early January and booked our 5 year old in with BASS, absolutely fantastic, our son had a great time with Lesley, couldn't rate them highly enough. I'd go with BASS everytime. Andy Cavet who works for Les Gets Snowsports is a superb instructor. He taught my children (who had never skied before) for a week and by the end they were whizzing round the mountain no problems!! !